As beauty editors, we get bombarded with a ton of new products every day (we know—tough life). Reviewed is a series where we report on some of the best products we've tried. Whether it's a drugstore lipstick that lasted all day or a hand cream that saved us this winter, you'll find all of our favorites in this column. Enjoy! We're all busy, right? We wake up before the sun to begin our days and don't leave the office until it's been dark for hours. It's easy for that type of lifestyle to leave us feeling restless and unsettled—at least, it is for me. As such, I'm consistently on the hunt for natural ways to ease anxiety and garner groundedness. 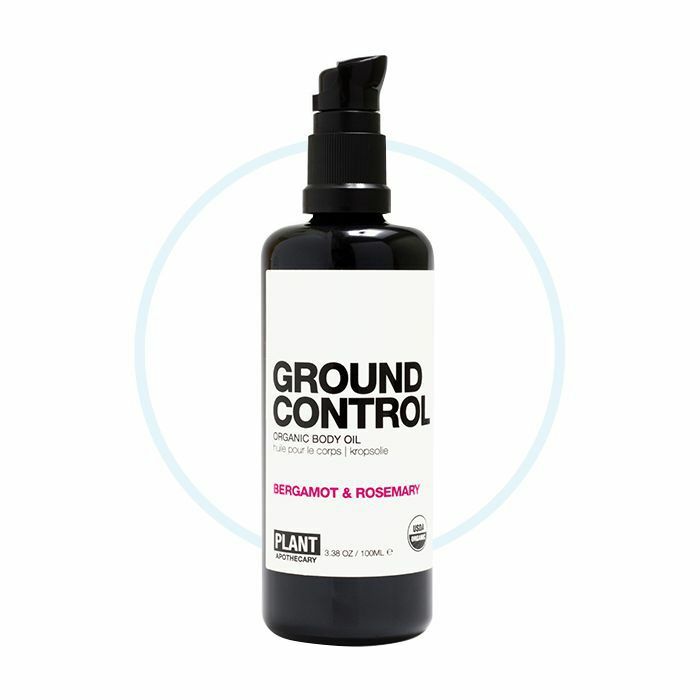 Plant Apothecary (a Brooklyn-based natural skincare brand founded by husband-and-wife team Holly McWhorter and Bjarke Ballisager) sent an email announcing its newest product Ground Control Organic Body Oil ($38) just a few weeks ago, and it really spoke to me. Get this: It's an organic body oil formulated with rosemary and bergamot to help sharpen and calm your mind at the same time. I applied the silky blend—it has a base of organic sunflower and apricot seed oils, so it's hydrating but quite light—and massaged my skin. It smelled amazing, like savory lavender, citrus, and apricot. I felt soothed and calm almost instantly. The thing is, these ingredients are proven ease stress and anxiety. "Exposure to essential oil for one hour was found to be an effective method of relaxation, as indicated by decreases in the heart rate and blood pressure," says Kai-Jen Chuang, Ph.D. In fact, one of the primary uses for rosemary essential oil is to reduce nervous tension and fatigue, and one study found when ICU patients sniffed lavender, chamomile, and neroli, their anxiety levels dipped significantly. So, thanks to this handy little oil and its expertly mixed ingredients, I'm feeling better already. For a quick refresher on all things essential oil, peep our beginner's guide. What are your favorite calming products? Let us know in the comments below.